BUT for the right reasons? A tight, taut little thriller. Looks like Jim from The Office USA has a prosperous career in directing with his first foray into horror. AQP reminded me very much of M. Night Shyamalan’s Signs BUT instead of alien beings with a water allergy attacking a planet predominantly made of water; we have blind blood thirsty creatures hunting down prey in rural America through the medium of sound. A nail biting opener established the premise and set the tone. Gripping, tense and unsettling as the Abbott family foraged for supplies. 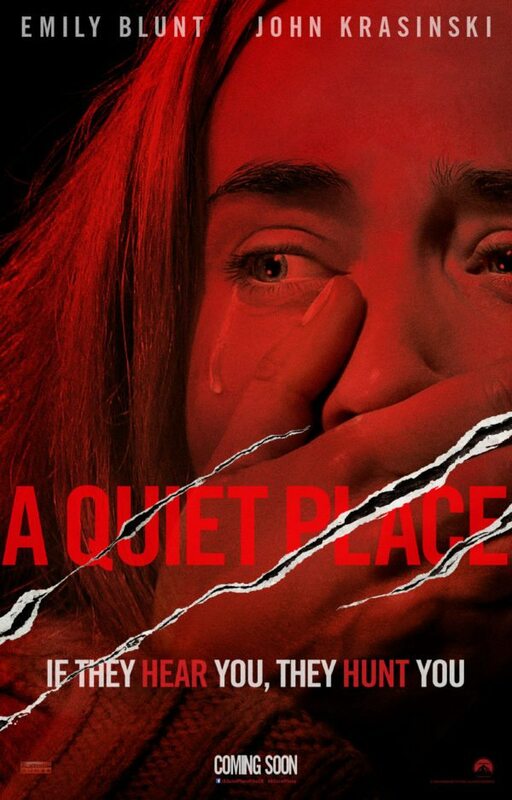 The silence perfectly executed and (despite my grumblings about some of the silly giggly people in the cinema) effective. It really complimented some of the “jumpy” bits (which there were many) and packed a punch! Krasinski leading us into a false sense of security at every corner. Only for a slight movement; a creaky step or a stupid toy putting you on tenterhooks . . . The special effects on the “creatures” were impressive. The detail, most notably, on their intricate sonar abilities. Marco Beltrami’s gripping score delivered when the characters reluctantly broke the sound barrier for survival. BUT the real credit must go to the cast. Flawless. And essential as the film revolved primarily on the family unit. Naturally, there was great chemistry between husband/wife team John Krasinski and Emily Blunt. A couple doing their best to survive and protect their children. Normally, I find that kids in horror films (Well, the majority of them) are a recipe for disaster BUT Millicent Simmonds and Noah Jupe were brilliant as the siblings. Most notably, Simmonds. She stole the show as Regan. I have to commend Krasinski for hiring a deaf actress to play the role. I loved the father/daughter dynamic as Lee tried to correct his daughter’s impairment. Their fractious relationship provided an extra depth to the piece. However, it wasn’t perfect. The pacing did test in places (Despite the 90 minute running length) with a little too much indulgence on the tip-toeing around for me. And I couldn’t help BUT laugh at the fact that Evelyn and Lee would even considering bringing another child into this post-apocalyptic world; knowing that their area is surrounded by these things?! BUT there wouldn’t have been much of a movie otherwise. And it wouldn’t have allowed for some of the most suspenseful moments of the film as Evelyn hid in a tub from said creature while in labour. And I know that there’s nothing wrong with a little mystery BUT I wanted to know more about those creepy entities. It didn’t spoil anything by all means BUT I wanted more. The finale brought it home and was brilliant. Even if I felt a little short changed with the outcome. BUT I couldn’t help BUT walk out of the cinema, impressed. A gripping premise delivered by a talented and underrated cast. A indie horror that delivered thrills and tension by the bucket load. Worth a watch.